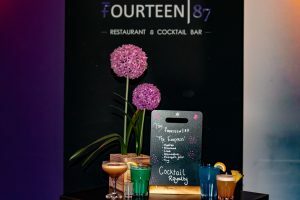 Fourteen 87 is a Restaurant and Cocktail bar in Catford, Lewisham which opened in 2018. The Caribbean style restaurant brings the latest cocktails and amazing food. 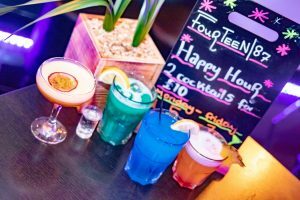 It was Monday evening when we ventured to Fourteen87 to sample their unique cuisine and see what their drinks menu had to offer. 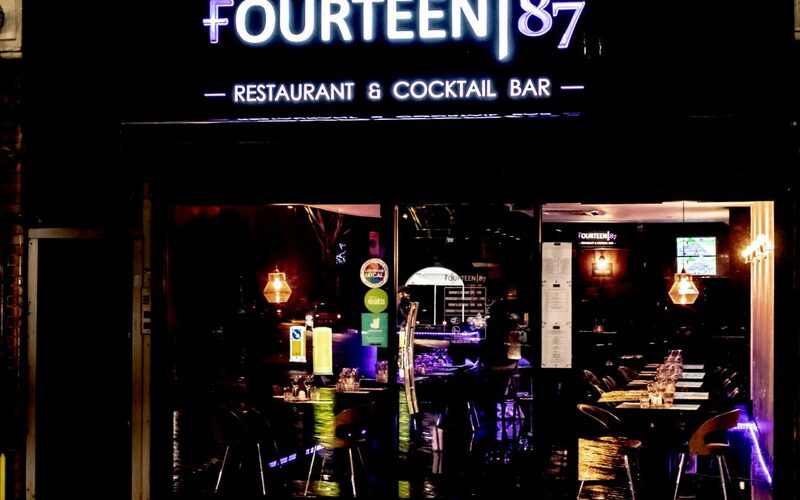 Fourteen 87 is on Uber Eats and Deliveroo and that’s how we stumbled across the restaurant. We were in the throes of a work meeting and we wanted to order some food, we scoured Uber Eats until we found the restaurant. 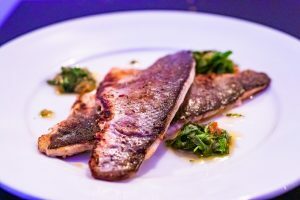 The delicious menu caught our eye straight away especially the 4 small dishes for £20 or 5 small dishes for £25. Considering we couldn’t decide this made the selection easier, we ordered a few different dishes. Sweetcorn fritters, Callaloo and Ackee Pattie, Trinidadian Doubles and Sticky Barbecue Chicken Wings all seasoned to perfection. They arrived on time, still looking beautiful and still hot. Let’s just say we vowed that whatever we didn’t order we would taste at the restaurant. A few weeks later, we arrived in the lovely restaurant to luxurious purple décor that made us feel like Royalty. The entire restaurant transformed your aura into a King or Queen. Add this to the positive affirmations and the lavatories being labelled King and Queen, we were ready to have a meal fit for Meghan Markle. 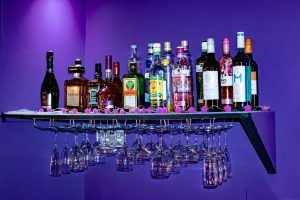 We sat at the bar and tried a few of the signature cocktails that were all created by the owner, Leke. Just like the dishes we received on Uber eats the dishes we were eating did not disappoint. We had the Grilled Tiger Prawns with a refreshing pineapple and scotch bonnet salsa. Let’s just say the salsa gave the prawns a lovely kick but not too much. Next was the Callaloo and Ackee Pattie something we had eaten previously. 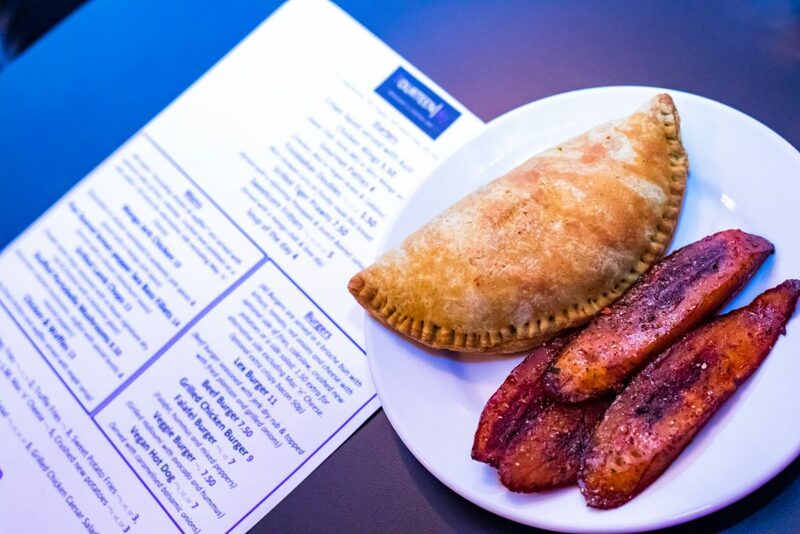 One thing we noticed was on the Uber Eats delivery the Pattie comes with Plantain, however in the restaurant it comes on its own. You could always order a side of plantain, I was still in my happy place. The main courses came shortly after and still able to fit food in I dived in. The ‘Lex’ burger was unlike any burger I had tried before, Why? The burger has layers and the combination is superb. You have a Beef Burger rubbed with Jerk Rub, Fried Plantain, Grilled Onions, Salad and Cheese. It was one of the best burgers my friend said they had in a long time. I had the Pan Seared Lemon Pepper Sea Bass with Truffle Fries. I will start by saying if you only have £3 in your pocket then you need to try these fries they will change your taste buds for the better. After debating whether I could fit in anymore food I had to admit I was full. I was a little bit disappointed in myself as I really wanted to have a dessert. I had already tried the Waffle Apple Crunch on Uber Eats. However, it has given me another excuse to go back to the restaurant and cocktail bar. Although an excuse isn’t needed with such delicious cuisine.